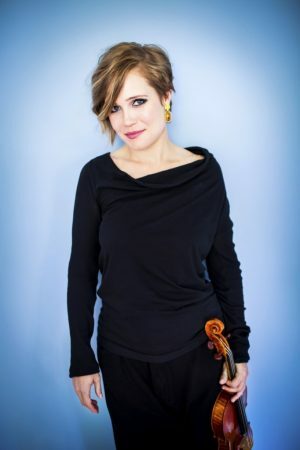 Leila Josefowicz’s passionate advocacy of contemporary music for the violin is reflected in her diverse programmes and enthusiasm to perform new works. In 2008, she was awarded a prestigious MacArthur Fellowship, joining prominent scientists, writers and musicians who have made unique contributions to contemporary life. Highlights of Josefowicz’s 2018/19 season include concerts with the New York Philharmonic, Cleveland Orchestra, Hong Kong Philharmonic, WDR Sinfonieorchester, Tonhalle-Orchester Zürich, Oslo Philharmonic, and the Houston, St. Louis, Toronto and Baltimore symphony orchestras, working with conductors at the highest level including Jaap van Zweden, Christoph Eschenbach and Matthias Pintscher. Josefowicz has released several recordings, notably for Deutsche Grammophon, Philips/Universal and Warner Classics and was featured on Touch Press’ acclaimed iPad app, The Orchestra. Her latest recording, featuring Scheherazade.2 with the St Louis Symphony conducted by David Robertson, was released in 2016 and nominated for a Grammy Award. Josefowicz’s recording of Esa-Pekka Salonen’s Violin Concerto with the Finnish Radio Symphony Orchestra conducted by the composer, was also nominated for a Grammy Award in 2014. Leila was awarded the Avery Fisher Prize in 2018 for outstanding achievement and excellence in music.